Northern Ireland winger Niall McGinn has joined Brentford on a season-long loan from Celtic - after he signed a one-year extension at Parkhead. The 23-year-old has won 12 caps, having made his debut as a substitute in a 2-0 defeat by Hungary in 2008. 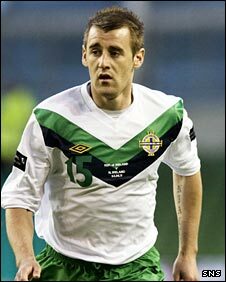 McGinn impressed with Derry City before moving to Celtic in 2009 and has made 25 appearances for the Bhoys. The midfielder becomes new Bees' manager Uwe Rosler's fifth signing since his appointment in June. Rosler told the club website: "Niall is a quick, very direct player and has a very good work ethic. "The deal has come about because of the links Mark Warburton has with Celtic and it is fantastic news for the club that we can get a Northern Ireland international who is young but proven at the top level." McGinn, who will fly out to join the Brentford pre-season training camp in Norway on Saturday, now has two years left of his contract with Celtic. "I felt we were a little bit thin on the wings so we now have good numbers and competition for places," added Rosler. "Niall wants to play at the highest level and we can help him do that."